Victor Ehikhamenor and Koleka Putuma shared their brilliance at the Goethe Nairobi on March 16th, 2017. They were moderated by Daystar University don Dr Wandia Njoya. Artistic Encounters is a new project running out of Goethe Nairobi where artists of different genres meet and share their art. 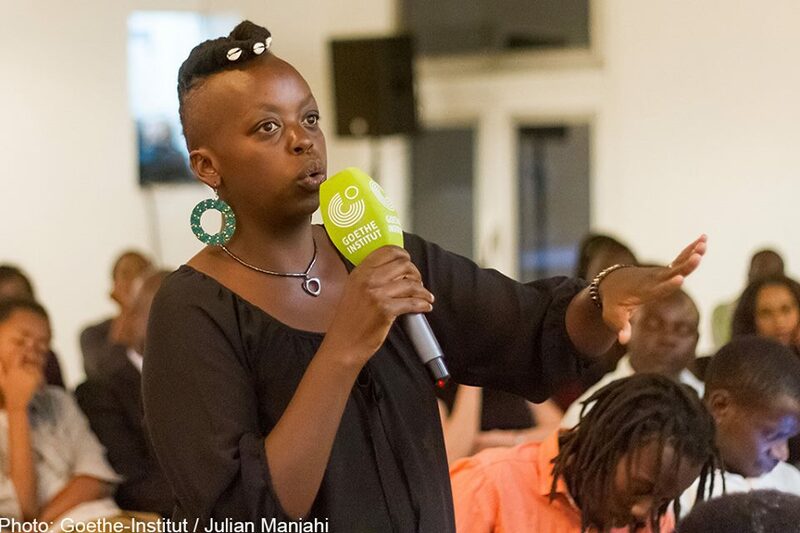 The project curated by Zukiswa Wanner will see artists from all over the world share the stage at the institute’s Maendeleo House in Nairobi. The first in the series kicked off on March 16th with Nigerian artist, photographer, designer and writer Victor Ehikhamenor and South African poet and theatre director Koleka Putuma. They were moderated by Wandia Njoya. 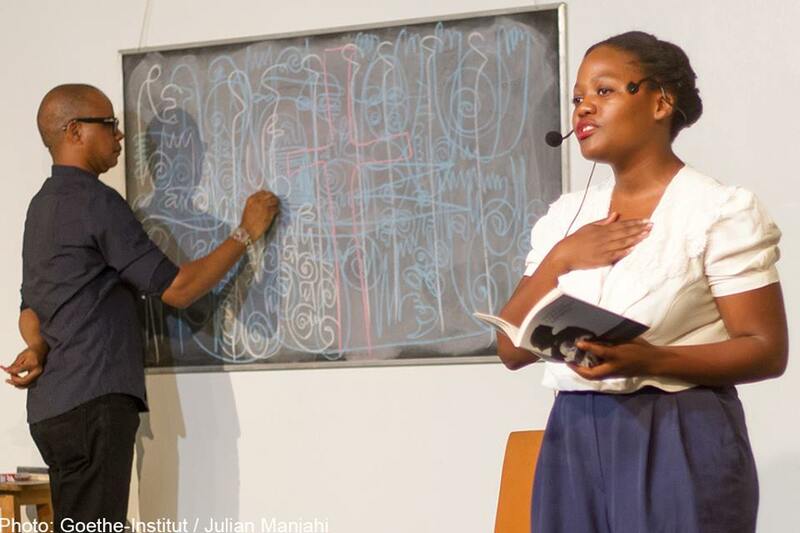 The evening started with performances from the two interspersed; Koleka read her poetry including her while Victor drew his art a chalkboard in the background to the recital. It might sound a bit weird when you read it but it was a really cool way to enjoy both art versions. Check out a video of the performances below. After the performances, the moderation part of the evening with Wandia Njoya asking questions of the two about their work. 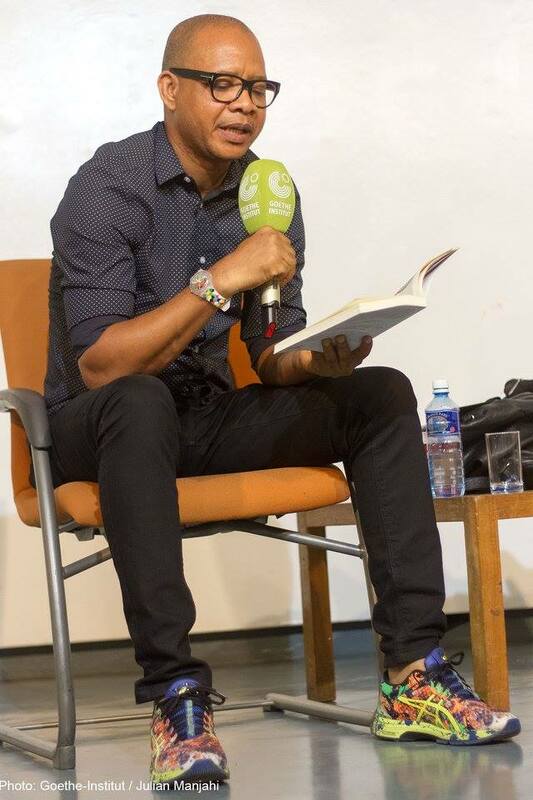 Victor has been published in his own right with a collection of poetry as well as essays based on his work at a Nigerian newspaper called Next that has since folded. By popular demand, they ended the discussion with Koleka reciting her famous poem Water while Victor drew. At the end of the show, the Nairobi audience who had come in large numbers all got to buy book and get their books autographed by the artists who they had encountered. 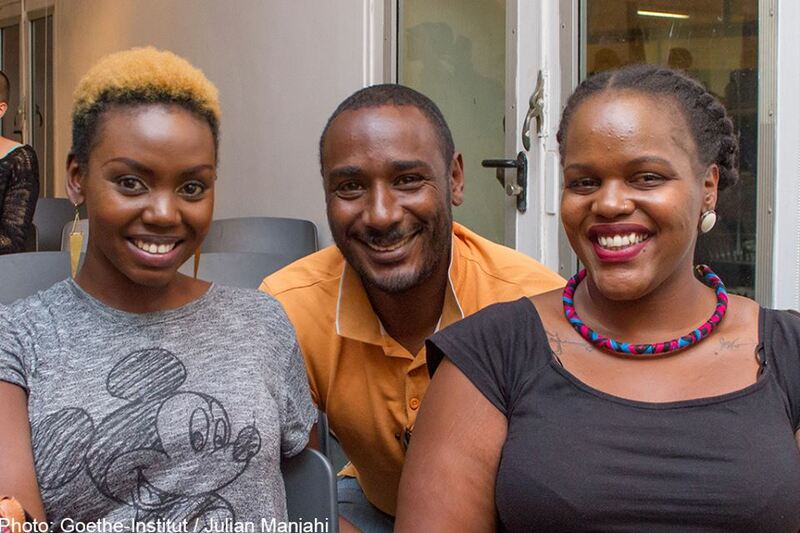 Nairobi readers know good art when they encounter it. Future editions of the Artistic Encounters will feature authors Lola Shoneyin who wrote The Secret Lives of Baba Segi’s Wives, and Angela Makholwa the author of Red Ink, The 30th Candle (our review) and The Black Widow Society Christine Kamau. They will feature other artists like singer and actress Patricia Kihoro, journalist and performer Maimouna Jallow and trumpeter Christine Kamau. Below are images from the Goethe take on the day. 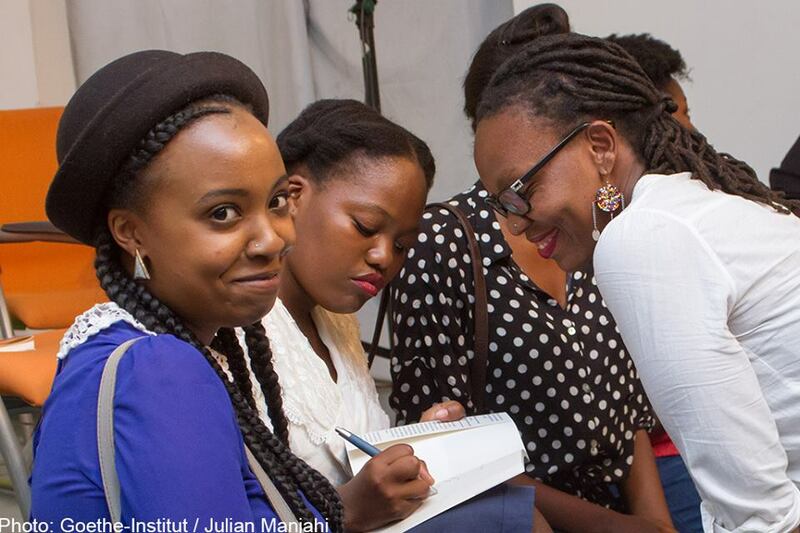 They are courtesy of Goethe Institut Nairobi and were taken by Julian Manjahi. 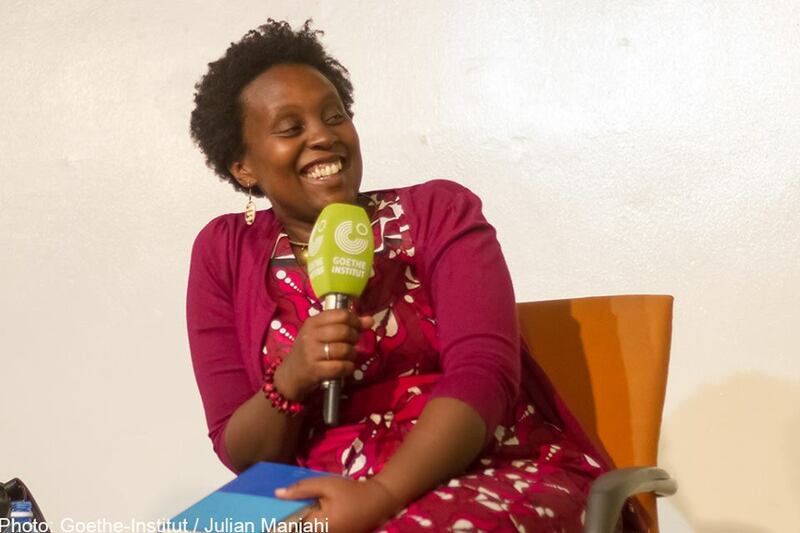 Pingback: Olumide Popoola, Ngartia rock the crowd at Goethe Nairobi. Pingback: Shadreck Chikoti, Abu Sense kick off Artistic Encounters 2019.